There are about 133 million babies born every year. About 12.5% that’s more than half a million a year of babies in the U.S. are born prematurely. 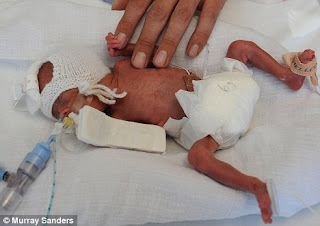 Many problems come with being born prematurely they are in danger of dying after being born or have special needs. A normal term for a full pregnancy is about 40 weeks, Babies born before 37 would be classified as a premature pregnancy. Premature births are a serious health problem. Babies born premature are in danger of newborn health problems, such as breathing problems or even death. Intensive care units are used to car for babies born prematurely along with its own staff to deal with a child born premature. Not only are the babies in danger of new born problems they face long lasting disabilities. Such as mental retardation, learning and behavioral problems, cerebral palsy, lung problems and vision and hearing loss. Some studies show that’s it can also cause autism in them. Some precautions can be taken to help a child born prematurely. If a doctor suspects that a women is going to have a premature birth they will give her corticosteroid drugs. These drugs help speed up the manufacturing of the lungs which will stop the babies from having breathing problems and death. The doctor will also give her a shot that delays the labor process for a couple days. This will allow the doctor to give her the drugs and to get everything ready that a premature baby survives thus giving the child a better chance of survival. Any woman can be in the risk of having a child born premature but other woman are in a greater risk of having a child born premature. Women who have had a previous premature child, a woman with multiple babies such as twins or triplets, and woman with certain uterine or cervical abnormalities. Also the life style of woman may cause the birth of a premature child such as smoking tobacco, drinking alcohol, or using illegal drugs. In conclusion Premature babies are a challenge to care for. The chance of having a premature baby is not slim. Although they have special equipment and percussion for children born premature it is still dangerous, not only after birth but through their life if they receive a mental illness. There are many precautions to take if you are pregnant and don’t want a pr mature baby.